I was recently in a check-out line and saw a bottle of “Crack”. I had to look. The clever description made it impossible to resist. So , what is “Crack”? Well, it’s not what you’re thinking (I would never condone drugs). This is a hair care miracle. 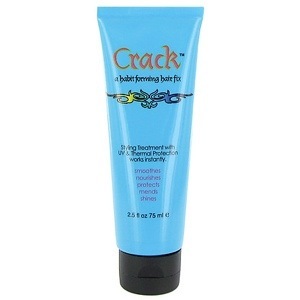 Named Crack for it’s addictive, habit-forming properties, this cream does everything you need it to do. Formulated with acai extract and silk proteins, this product moisturizes and protects hair from dryness and chemicals, including chlorine. It offers thermal and UV protection, and moisturizes from the hair cuticle to the ends. And this wonder blocks the effects of humidity and eliminates up to 95% of frizz and curl. As you can see (and no, this isn’t me), it really does work. From the first application, my hair was shiny, more manageable, and very silky. And I can also vouch for the humidity claims. This summer has been one humid mother, and this product keeps my hair smooth all day long. Applied to towel-dried hair, Crack makes blow-drying a snap. The brush glides through hair and makes the whole process much easier. I’m left with hair that has tons of volume and looks smooth as glass. I’m already addicted. But a warning, a little bit goes a long way. Bring it along this weekend so I can try it!! This almost makes me wish I had longer hair so I could use it. If it works like the picture, it is a miracle! !